When Will Cheap Offshore Wind Come to America? On this week’s Energy Gang podcast, we look at record-low prices for new offshore wind projects in the EU. We've heard a lot about record-low prices in utility-scale solar. 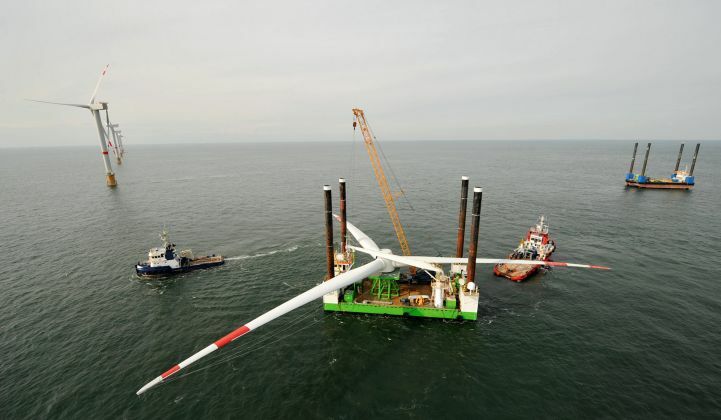 Get ready for more records in offshore wind. In the last two months, we've seen offshore project developers in Europe bidding for pennies per kilowatt-hour -- easily beating 2020 price estimates. Now the Europeans want to export that learning to America. In this week's episode, we'll look at how the two markets compare -- and why some of the market and policy conditions that favor offshore wind developers in Europe don't exist in the U.S.
Then, Energy Secretary Rick Perry wants to know if renewable energy is a danger to America’s grid. His recent memo on energy markets was only a page and a half long, but it was packed with a lot of assumptions -- and we'll unpack them ourselves. Finally, we'll discuss Plug Power’s deal with Amazon. It’s not just about fuel cells -- it’s about finding any cost advantage in the ultra-competitive retail sector.